through the testing of Erosion Control Products and Sediment Retention Devices. is the leading independent commercial lab for large-scale testing of Erosion Control Products (ECP) and Sediment Retention Devices (SRD). 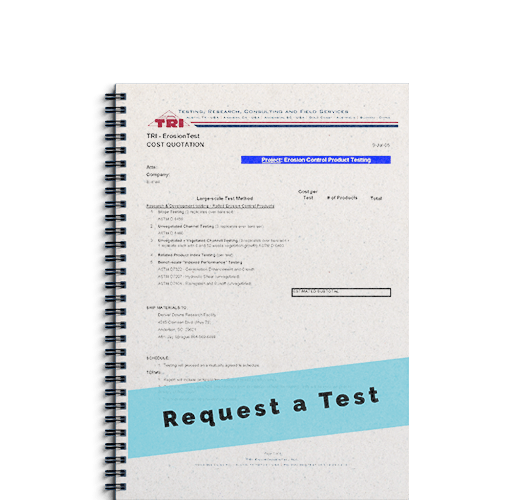 TRI employs trained technicians, standard operating procedures (SOPs), and the necessary equipment for all standardized test methods, and many non-standard test methods. All standard test methods can be run at any time. Typically, index testing can be completed and reported within one week of sample receipt (depending on existing workload). Bench-scale and large-scale testing turn-around also depends on lab workload, but is typically 6 to 8 weeks, including report issuance. TRI’s Denver Downs Research Facility is the leading independent commercial lab for large-scale testing of Erosion Control Products (ECP) and Sediment Retention Devices (SRD). TRI has, in place, trained technicians, standard operating procedures (SOPs), and the necessary equipment for all accredited test methods. Thus, all accredited test methods can be run at any time. Typically, index testing can be completed and reported within one week of sample receipt, depending on workload in the lab. Bench-scale and large-scale testing turn-around also depends on lab workload, but is typically on the order of 6 to 8 weeks, including report issuance. Based on standardized index tests we help clients assure quality and consistency in their products. Index, bench-scale, and large-scale tests as appropriate to assist clients with product development and characterization. We are the only independent commercial laboratory offering a full suite of standardized large scale erosion and sediment control testing.